How to find the surface area of a hemisphere? What's the area of a hemisphere formula? 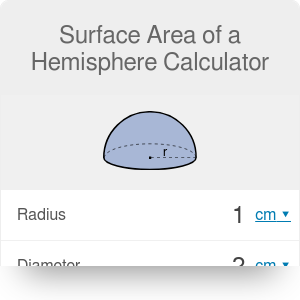 Our surface area of a hemisphere calculator is a handy tool that finds different types of hemisphere surface areas. Are you looking for an answer to the question of how to find the surface area of a hemisphere? Or maybe you just need to estimate it quickly? Whatever you plan to do, try this hemisphere calculator which comprises several various area of a hemisphere formulas. A / V - surface to volume ratio of a hemisphere. The interesting fact is that the total volume of two hemispheres equals the volume of a one full sphere. However, the same is not true with surface areas. The total area of two hemispheres is greater than the area of a sphere. The reason is simple: hemispheres have an additional base area. A(sphere) = 4 * π * r². Ac = 2 * π * r². Ab = π * r². A = 3 * π * r². This area of a hemisphere calculator allows you to find all three types of surface areas of a specific hemisphere. Moreover, you can do every calculation in different units (SI and imperial). If you want to learn more about area unit conversion, check out our area converter! 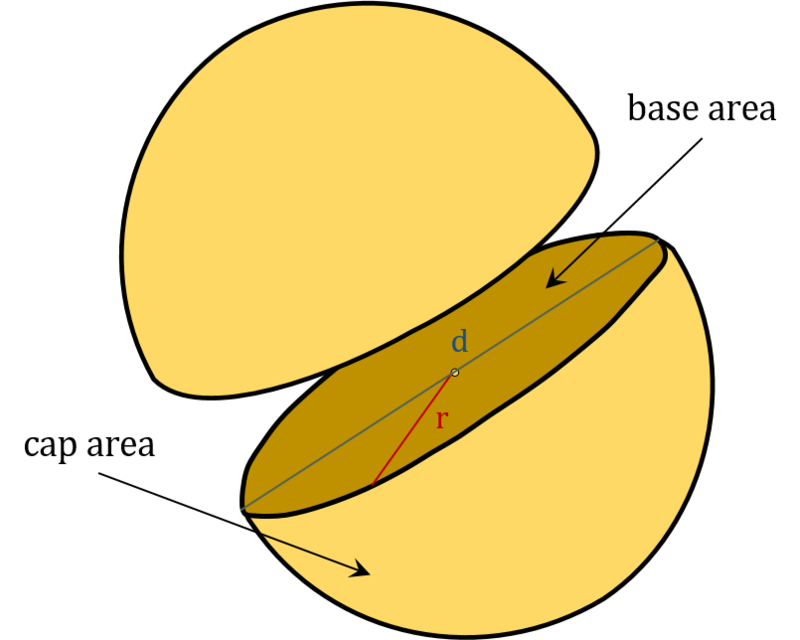 Surface to volume ratio of a hemisphere: A / V = 9 / (2 * r). Given surface to volume ratio: A = 243 * π / (4 * (A/V)²). As you know, the Earth is approximately a sphere with a radius of almost 6400 km, in which we can specify the northern and the southern hemispheres (specifically speaking, the Earth is a geoid). This division plays an essential role in geography and physics. For example, there is a force called Coriolis effect which acts on you whenever you travel by airplane, causing you to get off the course. When you're on the northern hemisphere, you will deflect to the right, and on the southern hemisphere to the left. Surface Area of a Hemisphere Calculator can be embedded on your website to enrich the content you wrote and make it easier for your visitors to understand your message.